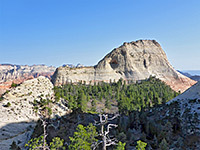 The Northgate Peaks are a pair of rounded Navajo sandstone summits at the edge of the Lower Kolob Plateau, towards the north side of Zion National Park, overlooking the lengthy canyon of the Left Fork of North Creek, and they may be viewed by an easy 2 mile trail starting from the Wildcat Canyon trailhead, along Kolob Reservoir Road. 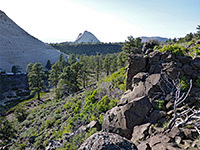 The path ends at a rocky promontory between the peaks, a fine viewpoint within sight of numerous domes and ravines in the center of the park, though the summits may also be reached, by unofficial continuation paths. The eastern peak is the easiest climbed, and has better additional views, across the upper section of the creek; the route up the western peak (which is 100 feet higher) is somewhat harder and longer, and the extra views are of less interesting, lower elevation land to the west. 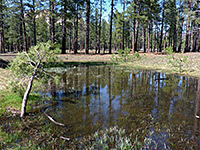 The main trail traverses a flat, sparsely wooded plateau interspersed with seeps and moist meadows, good for wildflowers in late spring and early summer. This section of the park is much less visited than Zion Canyon, and not even all of the small number of hikers at the trailhead are here for the Northgate Peaks - some come for the Wildcat Canyon Trail, which heads northeast towards Lava Point, and, via a second link path to the west (the Connector Trail), forms part of the 47 mile trans-Zion trek, from the Kolob Canyons in the northwest to the eastern park entrance on Hwy 9. Location map for Zion National Park. 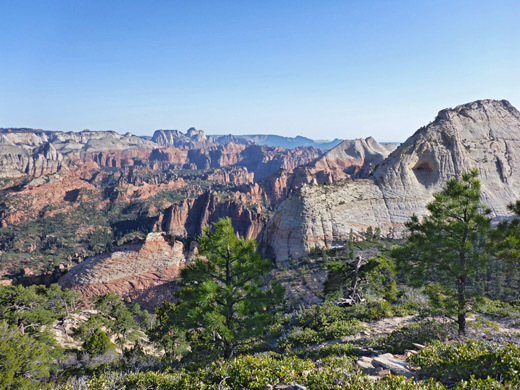 The Wildcat Canyon trailhead is just above the last major climb along the Kolob Reservoir Road, at elevation 7,000 feet, beside a grassy flat (Pine Valley) at the foot of Pocket Mesa to the east. The trail leads south and east across a grassy, stony field, soon entering open woodland of tall, well separated trees, lacking any major undergrowth. 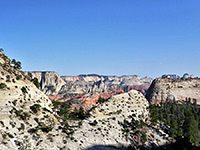 A sign marks the edge of the Zion Wilderness. The ground is still mostly covered only by short grass, with a few seeps, especially after snowmelt, where small but colorful wildflowers grow including dwarf hesperochiron, sagebrush buttercup and short-sepal bitterroot. A bridge takes the path over a stream (Little Creek) then, after a shallow pond, is the junction, on the right, with the Connector Trail, which descends below Pine Valley Peak and links with the Hop Valley Trail on the far side of the road. The path crosses a patch of drier land and runs alongside an upper fork of the creek to the next junction; Northgate Peaks are right, while the Wildcat Canyon Trail continues straight on. This latter route stays beside the creek for half a mile, crossing it several times before passing through a patch of thicker woods and running alongside a ravine (the upper end of Russell Gulch) then crossing a meadow, a saddle and more woods, and dropping down into the much deeper drainage of Wildcat Canyon. 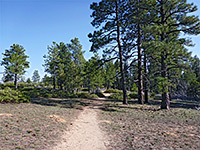 The Northgate Peaks spur path starts off level, over grassy, sometimes sandy terrain with scattered ponderosa pines and manzanita bushes. A sign on the left points the way down to the floor of Russell Gulch, via a tributary; used by through-hikers descending the Subway and North Creek. The sign also states the need for permits if taking this route. The trail continues due south along a broad, flat-topped ridge, giving only fleeting views of the buttes and valleys at either side; the twin peaks are seen only towards the end, as the path descends slightly to a jumble of basaltic lava boulders at the end of the promontory, habitat for many milkvetch plants. The route to the top of the eastern peak is briefly down a boulder-covered slope, through a few clumps of rigid bushes followed by a patch of trees, veering slightly north to an area of white slickrock around the base. 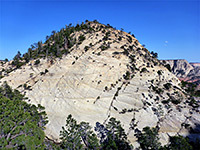 A cairned path leads steeply up the northern slope to the rocky summit, which has views in all directions; west to the other peak, south to the nearby, taller dome of North Guardian Angel, and beyond across a vast area of sandstone formations in the lower reaches of the park. The cross country route to the western peak is down the opposite side of the promontory into a narrow valley, another tributary of Little Creek, descending a little further as the valley curves round to the north side of the dome, then as before, scrambling steeply up across a mix of rock and sand, along a steeply-sloping ridgeline - a climb of about 550 feet.